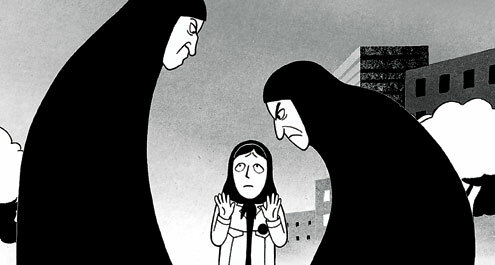 What makes PERSEPOLIS so strong is that the movie never pushes political consciousness beyond what a little girl would have. And then gives us an adult who shifts allegiances on believable terms. In other words, Marjane is a particular dramatic character and not A Bundle Of Westernized Feminist Metaphor. She goes from loving the Shah to yelling “Down with the Shah” overnight and talks about “communiss” and “che guevaro”; notices other people’s birthmarks becoming resistance wounds after the Islamic Revolution; gets a gang of kids together to bully the schoolmate whose father worked for the Shah’s secret police. She even creates her own religion in which “old people will not suffer … [because] it will be forbidden” (which isn’t as dopily far-fetched as some real revolutionaries). The film also does a fine job recreating the look of a comic book — thanks to black-and-white, outsized characters, exaggerated shapes. Yet, this is also an “animated” cartoon — the closest comparison are some of the Betty Boop and Felix the Cat shorts from the 20s (or a less-busy Tex Avery) and PERSEPOLIS sometimes even borrows from the “silhouette cutout” look of the Lotte Reiniger silent classic THE ADVENTURES OF PRINCE ACHMED. The only weakness, really, is a slight case of “and-then-ism” inherent in biographical stories. I don’t know how widespread a release PERSEPOLIS will get, but it’s accessible and “childish” enough to be a perfect film to introduce kids to subtitles. 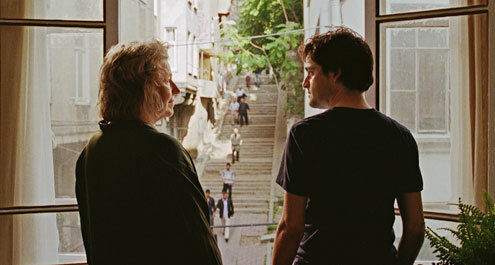 It’s also quite a “conservative” movie for adults, as the role of communists in the Islamic Revolution is presented upfront (including their various stages of denial, with a self-deception almost worthy of Foucault himself), as is the reaction of an Iranian, even a progressive one, to the West’s self-indulgence, hedonism, poseur-nihilism, free-love, and how we somehow consider it deep to note the current image of Santa Claus as originating in a Coke commercial. My friend Ryan once said that Tsai Ming-liang’s movies were like those exhibitions in which guys eat 20 hot dogs in 2 minutes: it’s a fascinating and amazing stunt, but at the end you’re wondering “what the hell’s the point.” That was basically my reaction to this film, my first complete exposure to Tarr. The mildly-positive grade is a reflection of a movie this boring managed never to leave me bored (if that makes any sense). People more familiar with Tarr have said that this is his first effort with genre material (the “plot”[sic] is adapted from a Georges Simenon pulp-crime novel) and it’s too alien to his talents, which hardly apply to such things as creating plot, tension, or character conflict. MAN FROM LONDON is all style, no content. But. What. Style. Tarr uses black-and-white like nobody this side of early Orson Welles, giving us high-contrast Hopper-like visions of men standing under lamps and docks holding off the waves of black ink crashing in from the sea. Tarr tracks like nobody this side of Max Ophuls, and to some strange effects, like having characters exit stage left and, while the camera tracks or pans over the scene while the sound mix is unaffected, having them re-enter stage right. 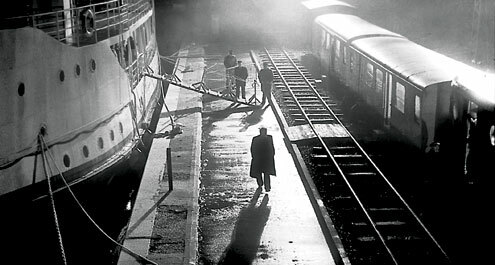 Tarr composes a shot and “cuts” within a shot like … well, nobody (maybe Angelopoulos), often starting with an element in the foreground, which conceals the scene’s other main element until his millimeter-a-minute track says it’s time for that other character to “enter” the scene. He also is a maestro of sound effects (the sea is the most important character in this movie, frankly) and using a few bars of theme music throughout after a scene has the whole composition. And he has more of a sense of humor (I’m told by Tarr devotees) than he shows here, though there is one unforgettable and completely irrelevant scene involving a chair, a billiard ball and an accordion player. Think of Kieslowski’s RED, rather than capping the Three Colors trilogy as the most magnificent by tying together the very notion of tying together, as a pale reunion of some of the characters of BLUE and WHITE, with more unseen-to-them connections and Juliette Binoche now acting as if her husband had never died. That should give you a sense of how frustrating I found this film’s third section, also called “The Edge of Heaven.” In fact, and back me up on this Ryan, just as the second section of this trilogy within a film called “The Death of Lotte” (the first section is “The Death of Yeter”), I let out a heavy breath, muttered “wow” and started to get up out of my seat, thinking the movie was over and eager to get out and proclaim the masterpieceness and festival-bestness of this diptych. But then the film continued with its third section and — well. Still BLUE and WHITE are still pretty fast company on their own terms and the fact that I’m using Kieslowski as a measuring stick should tell you something. Akin’s got a corner and an angle on a great subject matter, German-Turkish cultural exchange and clash, plus the sensibility to put his feet in both (i.e., it’s not “German oppressers, noble Turks” victimology). The first story is about an old (and old-school) Turkish man in Germany trying to make an honest woman out of a Turkish prostitute, despite objections from his Germanized professor son. The second is about a Turkish Kurd militant fleeing to Germany homeless and falling in with a university student. There’s not a false note in the performances. The stories play out ironically, but never cheaply. And these two stories mirror and thus comment upon each other — each basically involves someone trying to “save” someone else, in part through a sexual relationship. With the third section, it wasn’t simply that it ruined the architecture, but that it was syrupy on its own terms (a spit in the face moment aside) and the extra connections (plus such Closed Captions for the Thinking Impaired camera gestures as Mike notes here) just made the whole thing look too contrived. A conversation involving Coenheads (which, by the standards of Gen-X cinephiles, I am not) invariably involves which of their wildly-varying films you like best. My favorites are BLOOD SIMPLE and FARGO, followed at a distance by MILLER’S CROSSING and THE MAN WHO WASN’T THERE, while I outright detest O BROTHER WHERE ART THOU, RAISING ARIZONA and THE HUDSUCKER PROXY. In short, I dig the crime movies and diss the pure comedies. So, on those terms, NO COUNTRY FOR OLD MEN is the Coen Brothers movie of my dreams. The first approximately 80 minutes of this Texas modern-day Western are as tight, focused and thrilling as BLOOD SIMPLE. 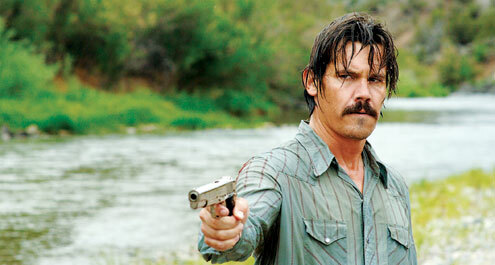 An innocent man (Josh Brolin) comes across a cat-case full of money left from an unseen drug deal gone bad. The millions are also very badly sought by a hired assassin (Javier Bardem, “the Iberian Lee Van Cleef,” the Coens called him during the intro, just 10 feet away from Yours Truly). Set piece after set piece in motel rooms, trucks, rivers, and border crossings follow, with nary a wasted gesture and very few of the Coens’ beloved words. The last 15 minutes or so, I was initially resistant to. SPOILER WARNING: From the point where Brolin talks to Bardem and basically gives the “now it’s personal” speech from a thousand vigilante or “righteous dude” movies, the Coens start to frustrate the riled-up genre expectations (deliberately and to great effect, I eventually decided and I’m curious how an America that hated the ending of the Sporanos will react to this movie). The climactic central-characters shootout occurs offscreen, and the Coens stop giving us “money shots” of people killing. The film gets a bit more philosophical as Tommy Lee Jones’s sheriff takes over the movie’s center. He has the Marge role from FARGO, only his investigation was hardly noticed by Bardem and Brolin. But both in the starting voiceover (which replicates Marge’s “it’s a beautiful day outside … all this for a little bit of money” speech at the end of FARGO) and the last few scenes, Jones speaks as a man who is shown decisively his obsolescence, how his time, Marge’s time, has been surpassed by contemporary brutality. People “just knew” things in the past, but “once you quit saying ‘sir’ and ‘ma’am,’ it’s all over.” It’s as if FARGO had ended with Marge quitting the Brainerd Police because “I just don’t understand.” This is still my favorite film of the fest as I write. 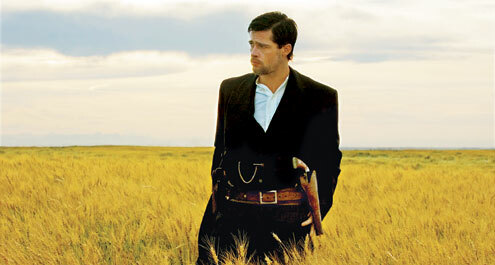 Here’s another elegiac Western and seeing it right after NO COUNTRY FOR OLD MEN did not do it favors. Like LIBERTY VALANCE, it’s about the construction of legend. While the rap against this movie will be “too long” (the comparisons to LEGENDS OF THE FALL will be legion) and it IS longer than it needs to be narratively, it’s never boring. The irrelevant or too-long set pieces — for example, a dinner conversation that has echoes of the Joe Pesci “am I funny” scene in GOODFELLAS — are entertaining on their own terms, or maybe tension-filled is the better term. And after the event in the title happens at about the 140 minute-mark, we get a lengthy coda, and people are gonna be shifting in their seats wondering “is it over now.” But it’s both brilliant on its own terms (especially stylistically with the use of freeze-frames) and absolutely essential to the film’s thematic point about “the coward.” Still, BONNIE AND CLYDE did everything this movie did with about an hour to spare. Brad Pitt won Best Actor at Venice and he’ll be a (deserved) AMPAS front-runner. His natural charisma and bad-boy image, both in real life and from roles like Tyler in FIGHT CLUB, make him both an effective gang leader and a psychopath. Someone whom the same man would both join from love and kill from fear.